For Dr Eric Cher, pursuing orthopaedic surgery allows him to meld two of his biggest interests: patient care and medical device innovation. Even though he studied biomedical engineering as an undergraduate, he does not see his switch to medicine as an abrupt move, but rather as a natural progression. His current specialisation was greatly influenced by his engineering background, which equipped him with the skill to analyse clinical problems systematically and to better appreciate the biomechanics of the human body. Dr Cher, currently a senior resident with SingHealth, believes that orthopaedic surgery, in particular, allows tremendous opportunities for translating creative engineering ideas into implementable technologies. When he made the decision to pursue a medical degree, the Doctor of Medicine (MD) programme offered by Duke-NUS Medical School was Dr Cher’s first choice as it was the only school that gave him the opportunity to experience a United States-based curriculum right here in Singapore. Another draw was the school’s unique teaching style. Dr Cher believes that its strong emphasis on team-based education and collaborative learning has reformed the way medicine has been taught traditionally. He added that its strong focus on evidence-based research and small faculty-to-student ratio from diverse backgrounds were also attractive to him, and made him confident “that my education at Duke-NUS will prepare me adequately in the ever-changing field of medicine”. The school honed his interest in clinical research by supporting his application to complete his research year in foot and ankle surgery at Duke University. During that year, his research involves the study of how dynamic activities affects in-vivo cartilage thickness of ankle in healthy individuals. His current research now encompasses clinical outcome studies on various orthopaedics conditions including traumatic hip fractures surgeries, adult flatfoot corrections and joint arthroplasties. Dr Cher says: “The school placed much emphasis on the importance of clinical research throughout the course of study. In particular, the third-year's research curriculum has deepened our knowledge in clinical research. 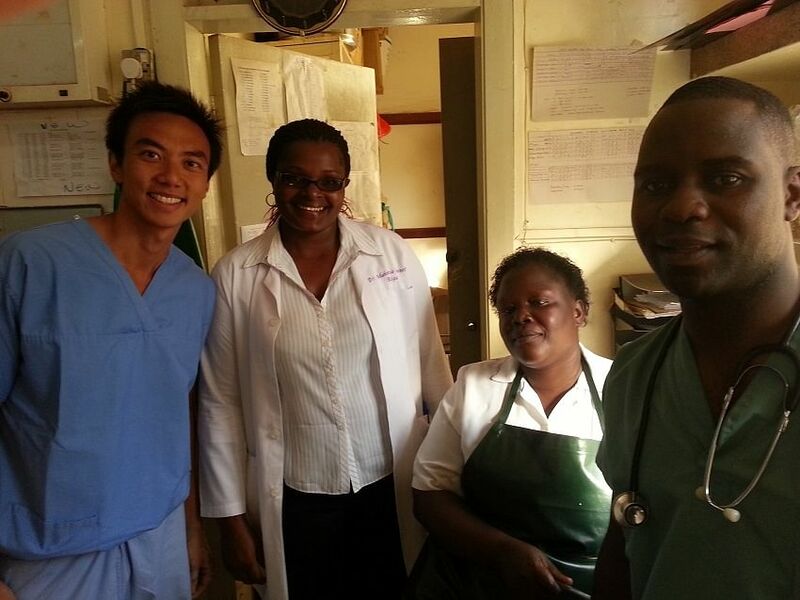 Dr Cher completed his surgical elective in orthopaedic trauma at Uganda's Mulago Hospital, where he participated in all aspects of patient care including ward work, clinic consultations and assisting in surgeries. Studying at Duke-NUS has also opened doors for him, particularly in the area of mentorship, which is vital for his career. Dr Cher considers himself fortunate to have access to a network of good mentors, both at Duke-NUS and SingHealth. In addition to providing him with guidance, they are also a constant source of encouragement and support throughout his medical school education and residency training. The school’s strong culture for community service gave him plenty of chances to take part in humanitarian work during his studies. Apart from participating in numerous local community service projects, he also led a four-day medical screening programme in Chiang Mai, Thailand. The time he spent at Mulago Hospital in Uganda, completing his surgical elective in orthopaedic trauma, remains as one of his most memorable experiences. During his time there, Dr Cher rotated through the casualty department that responded to emergencies and orthopaedic trauma cases. He participated in all aspects of patient care, from ward work to clinic consultations to assisting in surgeries. Dr Cher feels the experience made him appreciate the importance of a good healthcare system that caters to a country’s needs. The cross-cultural experience of interacting and working with the local community gave him new insights and perspectives that have significantly influenced his role as a doctor. “The best thing about being a Duke-NUS student is that you will always have the support from the school in ensuring that each of us excels in our individual aspirations,” he says.